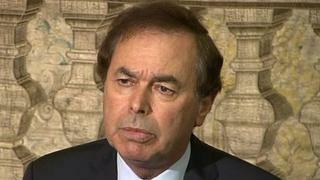 Ireland's Justice Minister Alan Shatter has resigned. Irish Prime Minister (Taoiseach) Enda Kenny announced the resignation. He said Mr Shatter had resigned following receipt of a report into allegations made by police whistleblower Sergeant Maurice McCabe. It is critical of a number of agencies, including the Department of Justice. He said the minister had taken responsibility for this and was stepping down. Alan Shatter was a very controversial justice minister. Deemed by many to be too close to the former police commissioner, Martin Callinan, he had only last month survived a vote of confidence. He announced his resignation after receiving a report, that won't be published until Friday, into how he and his department handled the issue of a police whistleblower. The whistleblower had raised concerns that senior officers had acted inappropriately in getting penalty points removed from the driving licences of well-connected offenders. Mr Shatter has said that he disputes some of the report's findings but he was going to take responsibility so as not to distract from the government's work. On Tuesday, a report by the Republic of Ireland's data commissioner also found that the former justice minister had broken data protection laws by disclosing, on live television, police information that an opposition parliament member had been using his mobile phone while driving. It's hard not to believe that his resignation also has something to do with the local and European elections. Too many bad news stories coming at the same time, about an already unpopular minister, probably sealed his fate. In his resignation letter, Mr Shatter said he disputed some aspects of the report. However, he said he was anxious that any controversy that arose from it did not distract from the work of the government, or create difficulties for the coalition parties in the upcoming elections. Taoiseach Kenny told the Irish parliament (Dáil): "The report is critical of the inadequacy of the actions of a number of agencies, notably the Garda Siochana [police], the Department of Justice and Equality and the minister. "He made up his mind and handed in his resignation, which I accepted with a reluctance." Fianna Fáil leader Micheál Martin said it would have been appropriate to have informed the Opposition about the report. On Tuesday, Mr Shatter was found to have broken data protections laws by disclosing personal information about independent TD Mick Wallace. Last May, Alan Shatter revealed to Irish state broadcaster RTÉ that Mr Wallace had been cautioned by police for using his mobile phone while driving. The issue became known as Shattergate. Mr Shatter survived a no-confidence motion in the Irish parliament last month. He became a government minister three years ago, and during his tenure he has never been far from controversy. Two bugging scandals, a very bitter row over drivers' penalty points and his failure to complete a breathalyser test at a police checkpoint kept him in the headlines. Mr Shatter, a lawyer, was put in charge of two government departments - justice and defence. As the Republic of Ireland introduced painful austerity measures, Mr Shatter set out on a wide-ranging reform agenda, which included plans to close more than 100 police stations.